Our State Senator Martin Golden was sworn in this weekend to his fourth term representing our community in the State Senate. 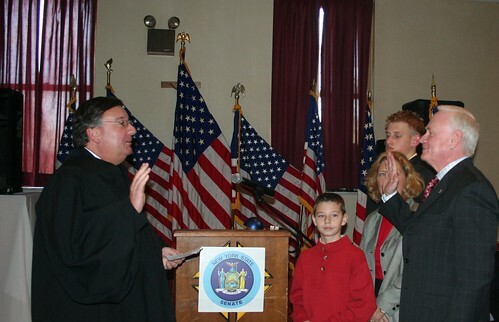 State Senator Marty Golden (R-C-I, 22nd District) was sworn in to serve his fourth term in the New York State Senate at a ceremony attended by more than 300 people held on Sunday, January 25, 2009, at the Knights of Columbus at 1305-86th Street in Brooklyn. Justice of the Supreme Court Matthew D’Emic administered the oath of office. Congressman Peter King served as the guest speaker. Senator Charles Schumer, Congressman Michael McMahon, Assemblyman Alec Brook-Krasny, and City Councilmembers Vincent Gentile and Michael Nelson were among the guests in attendance. Public School 180 performed some musical selections during the program. In his remarks, Senator Golden spoke of the economic crisis facing the City and State of New York, reminding those in attendance how it important it for New York to recover and become stronger than ever. Senator Golden indicated his plan to work tirelessly so that the budget cuts will least impact education, health care, seniors, and public safety. Golden also mentioned his successful efforts in his past term to see New York State adopt what is known as â€œGrannyâ€™s Lawâ€ to protect our elderly. Another proprietor of the broken two party system, championing the status quo. When will we learn that this Democrat is nothing more then a pimp and a whore? Voe Green, Vote Libertarian, Vote SWP, but for God sakes please stop voting Dempublician Republicrat. Robert Paulson is a dope and it sounds like he smokes some too!